Quigley, Declan 1987. Ethnicity without nationalism : the Newars of Nepal. European Journal of Sociology, Vol. 28, Issue. 01, p. 152. * S. M. Greenwold, Monkhood versus Priesthood in Buddhism, Newar, in von FÜrer-Haimendorf, Christoph (ed. ), Contributions to the Anthropology of Nepal (Warminister, Aris and Phillips, 1974), pp. 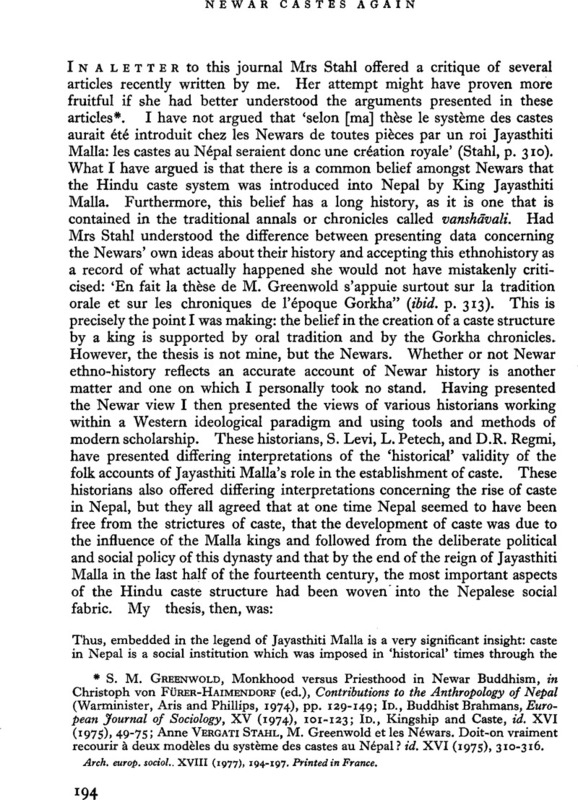 129–149; Id., Buddhist Brahmans, European Journal of Sociology, XV (1974), 101–123; Id., Kingship and Caste, id. XVI (1975), 49–75; Anne Vergati Stahl, M. Greenwold et les Néwars. Doit-on vraiment recourir à deux modèles du système des castes au Népal? id. XVI (1975), 310–316. (1) Poussin, L. de La Vallée, The Way to Nirvana, six lectures on ancient Buddhism as a discipline of salvation (New York, Cambridge University Press, 1917), pp. 475. (2) Allen, M., Buddhism Without Monks: the Vajrayana religion of the Newars of Kathmandu Valley, Journal of South Asian Studies, III (1973), 1–14; see p. 13.